Dr. Mark Souweidane studies the rare and currently fatal brain tumor diffuse intrinsic pontine glioma (also known as DIPG) in children. 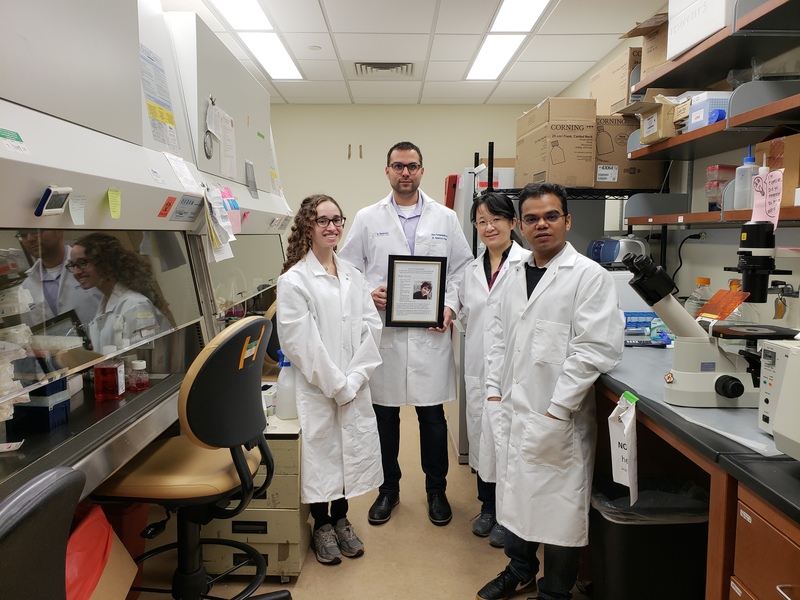 In June, Dr. Souweidane’s report on his team’s use of a new drug for DIPG was published in the prestigious The Lancet Oncology. Those in the childhood cancer community were encouraged to learn of the promising results coming out of Dr. Souweidane’s initial trial of direct delivery of a drug to DIPG tumors. Thanks in part to St. Baldrick’s support of Dr. Souweidane’s research, this treatment will be tested at multiple healthcare facilities. We look forward to hearing more from Dr. Souweidane about his mission to more effectively treat DIPG. For many kids with cancer, a bone marrow transplant is supposed to be a life-saver – a chance to move past cancer and enjoy childhood to its fullest. But that’s not the case for kids who experience Graft-Versus-Host Disease (GVHD), a new and painful battle that can start after their transplant is over. For many children and their families, it’s an incredibly frustrating fight that can result in severely damaged skin and internal organs. That’s where Dr. Melissa Mavers is hoping to make a difference. This St. Baldrick’s fellow is using a new form of cellular therapy to prevent the body from identifying transplanted bone marrow cells as invaders that must be attacked. For those affected by GVHD – like Abby – it could mean finally getting the chance to enjoy a normal childhood. We can’t wait to hear more about Dr. Mavers’ progress. A new tool from St. Baldrick’s Scholar Dr. Nickhill Bhakta can help us learn more about the impact of invasive treatments – like radiation and chemotherapy – on kids’ bodies. Called the cumulative burden metric, it’s used to track the health problems that often emerge following a childhood cancer diagnosis. It’s a tool that could help doctors and families identify health concerns early on, leading to better diagnoses and outcomes for kids as they grow. In July, we reported on the progress of St. Baldrick’s Scholar Dr. Gregory Friedman, a pediatric oncologist who’s using a variant of the herpes virus to kill cancer cells and stimulate the immune system to attack a child’s brain tumor. Tests showed promising results and we’re excited to learn how Dr. Friedman’s work will impact children in the future. One of the most devastating diagnoses for a child is atypical teratoid rhabdoid tumor, or AT/RT, a type of rare and particularly aggressive cancer. The very young children typically affected by it rarely live more than a year following their diagnosis. That’s why Dr. Rintaro Hashizume, recipient of a St. Baldrick’s research grant, is so keen on finding better treatments for AT/RT. Dr. Hashizume is exploring how gene therapy treatments could suppress or even stop the growth of AT/RT. Here’s hoping Dr. Hashizume continues to make progress in the fight against this deadly cancer. In October, we profiled Dr. Elliot Stieglitz, a St. Baldrick’s Fellow studying juvenile myelomonocytic leukemia (JMML), a type of blood cancer that affects young children. A rare disease, JMML typically impacts kids under age 2, making it hard to diagnose and treat. In closely studying the DNA of 100 young patients with JMML over a three-year period, Dr. Stieglitz gained a deeper understanding of how kids react to various treatments. Thanks to his findings, doctors can more accurately predict how JMML patients will react to certain treatments. As of late 2018, Dr. Stieglitz was working to unravel secrets about why the bodies of some children with JMML don’t respond to treatment as well as others. At the same time, his clinical trial investigating how JMML patients respond to a drug traditionally used for adult melanoma (or skin cancer) had entered its second phase. We’re optimistic that this will result in a more effective treatment option for kids with JMML. Later in October we talked to Dr. Jennifer Kalish about her research on Beckwith-Wiedemann Syndrome, or BWS, which causes young children to develop abnormally large organs. In addition to making life a challenge – for example, an oversized tongue makes eating and breathing difficult, while an oversized pancreas can pump too much insulin – BWS often leads to a cancer diagnosis in young children. Dr. Kalish wanted to find out why kids with BWS are more likely to get cancer and how we can predict when this will happen. Thanks to support from St. Baldrick’s donors like you, Dr. Kalish was able to help develop guidelines doctors can use with BWS patients to detect cancer early on, boosting their chances of survival. Looking ahead, Dr. Kalish hopes to determine how we can stop BWS from resulting in any cancer diagnosis. Ependymomas are tiny cancerous tumors that develop along the spine or in the brain. Typically, they affect young children: among diagnosed kids, 1 in 3 have yet to reach their third birthday. In November, we learned about how Dr. Gary Kohanbash, a St. Baldrick’s Scholar, is fighting ependymomas using immunotherapy. It’s a type of treatment that helps a body’s natural defenses learn to target and attack cancerous tumors like ependymomas. Since receiving a grant from St. Baldrick’s in 2017, Dr. Kohanbash has made lots of progress – in fact, he’s currently working on a vaccine that could significantly improve treatment outcomes, with the goal of testing it in a clinical trial at hospitals across the country. These are just some of the amazing researchers focused on putting your donations to work by fighting childhood cancers. We’re thrilled with their progress and can’t wait to share news about where their research is headed in 2019.